This was one of those breakthrough weekends. 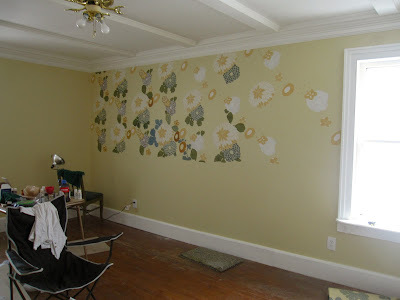 My epic painted wall project, shown above, is really starting to look good. It's starting to look like the wallpaper it's intended to emulate, shown below. In person, the colors look a little clearer. 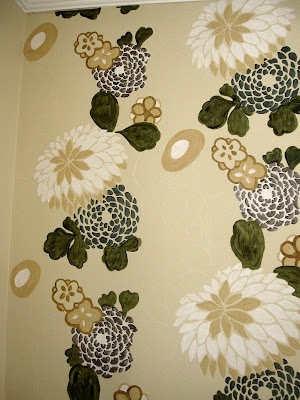 The breakthrough moment was like, hey, this might actually work, when I started adding in some pretty green leaves. I don't know why the leaves made it work, but they did. Look. I can't wait to see this done. Making progress on it is really enjoyable. As our interior work winds down (winds down! I never thought I'd be able to say that!) and the snow is still piled high outside, many times per weekend I find myself wandering around looking for something to do. Usually I end up in the Great room, here, with the space heater going and a paintbrush in hand. It's the perfect little mindful project. We procured a quote for having our floors refinished. And guess what? We'll be doing them ourselves. But think of all the money we're going to save! Just think! Sigh. I battled our extremely stubborn aforementioned nicotine-stained ceiling with a can of extremely stinky oil-based primer. It is now white as freakin' snow, and that is that. Patrick painted our laundry room (formerly the upstairs kitchen) and I somehow forgot to take a picture! 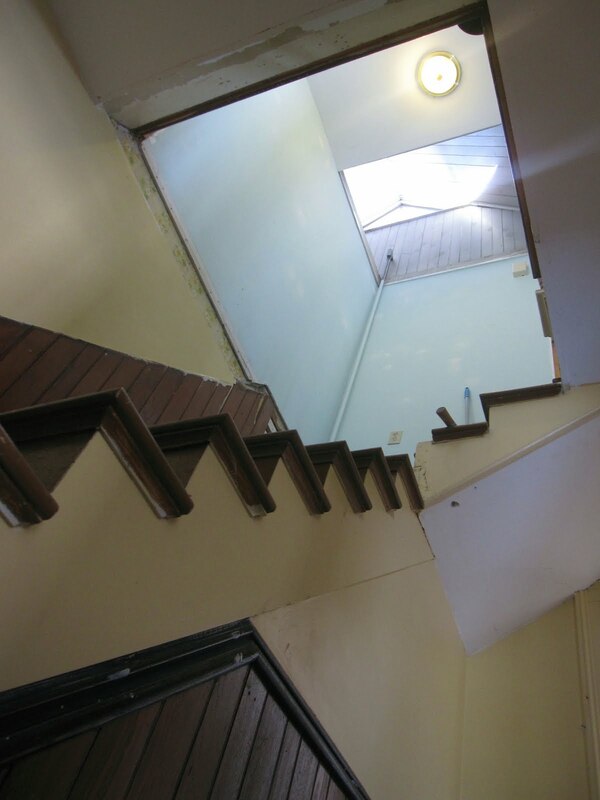 Mainly, though, we focused on getting the stairwell ready for paint. It's going to take a lot. It has taken a lot. Torn up rug, plywood and tarpaper from the top of the stairs. Removed the ceiling that had closed the stairwell off when they converted the house into two units. Removed awful vinyl flooring from the bottom landing and floor. Painted the trim. Two coats. 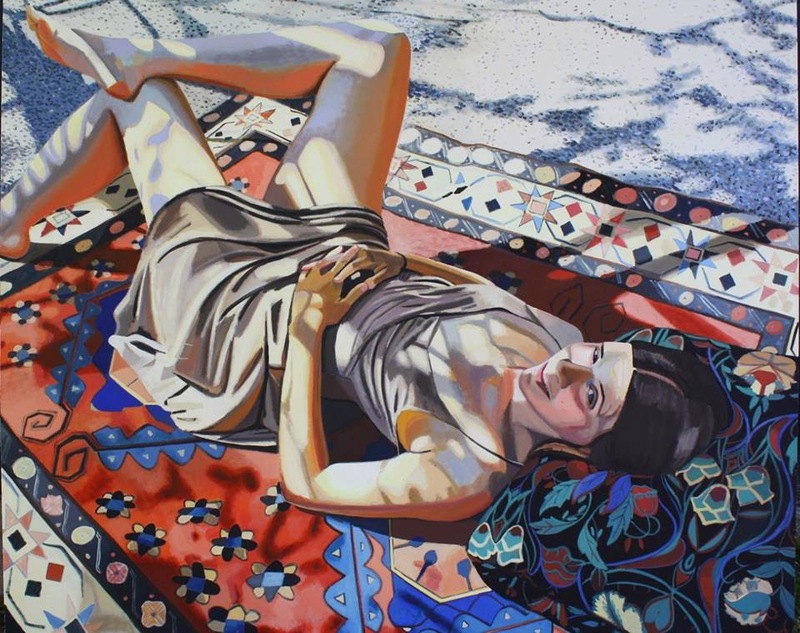 Most of the work, I think, is still to come. 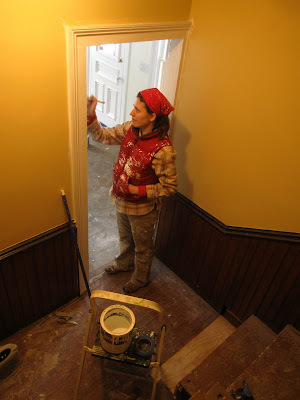 The wainscoting is going to be painted white (because as much as we love the original dark wood, it's pretty damaged in places and it'll look better painted). The walls are going pale gray. I really love the color we chose, and can't wait to show it off next weekend. Beyond that, we have a whole heap of trimwork-- including purchasing some new pieces and trying to make them look original-- balustrades, banister, etc. 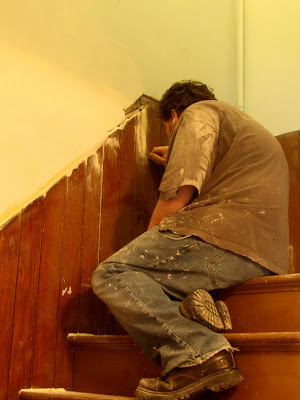 AND, not to forget, painting the actual stairs themselves. Boy howdy, we do have a ways to go. But, my goodness, it's going to look so good when it's done. Thinking of this view when the wainscoting is white, the walls are pretty gray, the risers are white, the treads are dark brown, the balustrades are re-installed and gleaming, and there's pretty things hung on the walls... and I can sit here, where I sat to take this picture, and look up, and just marvel at all the work we've done... That is going to be a good day. I can't wait for that day.